With Darius Petrošius withdrawing his candidacy for the post of Minister of Justice, the Social Democrats have proposed Julius Sabatauskas. Ramūnas Karbauskis, however, has announced that he will not present this candidacy for the president. The search for a Minister of Justice was discussed with Lithuanian Peasant and Greens Union fraction member Povilas Urbšys and Lithuanian Social Democrat Party fraction member Algirdas Sysas on the Dėmesio Centre show on LRT TV. - Mister Sysas, D. Petrošius withdrew his candidacy. What was he wary of? 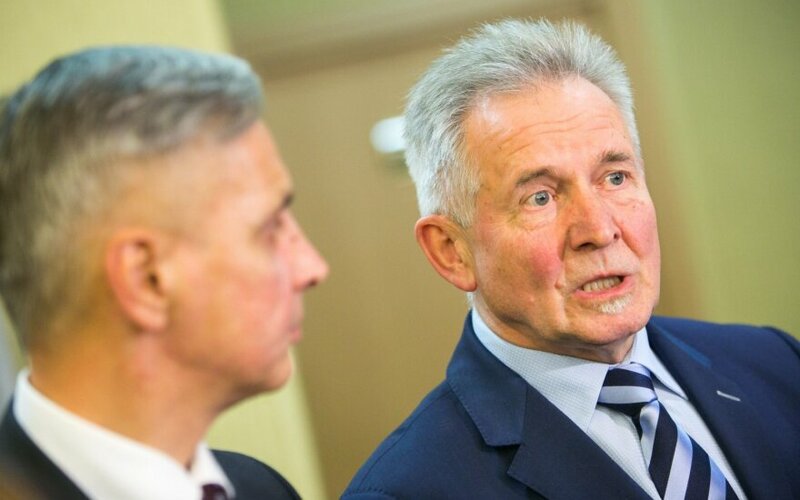 That Mr. Urbšys‘ suspicions of his connections with Arūnas “Švinius“ Pukelis from Tauragė would be proven or that information surfaced about suspicious land speculation done by him when he purchased land from pensioners for €2500 and intended to sell it for €400 thousand after changing its status? A. Sysas: I think that neither did. D. Petrošius released a statement, you can read it. Firstly, it’s the amount of dirt thrown at him and his family. It worked as usual, someone said something though no proof was presented. The prices that were back in the year 2000 and what happened in 10 years, they change. You can construct various conspiracy theories this way. When someone needs money, they sell cheap, thinking afterward that they could have sold expensively. Unwilling to harm the formation of the cabinet, he will strive to prove his position separately. - The SocDems probably received signals from the President that this candidate isn’t suitable? A. Sysas: The President does not contact me, but to my understanding, this dissatisfaction stems from the Peasant Greens. - But a party management meeting was called already on Friday, however it only happened after the weekend. A. Sysas: Yes, the question was specifically regarding Petrošius. A version was presented that he is not suitable. However I believe that S. Skvernelis formed minister candidacies and brought them to the presidential palace. No signals were made up to then. S. Skvernelis did not find D. Petrošius to be unsuitable. Similarly so with the President because otherwise the candidacy wouldn’t have been presented. That means there are internal conflicts in the Peasant and Greens party. - Mister Urbšys, why did you decide to speak up about links with “Švinius”? P. Urbšys: As was declared in forming the coalition, it was agreed that an attitude shift in political culture, transparency and competence is needed. Based on those principles I publically expressed my doubts on the candidate to the post of Minister of Justice. I only publically repeated already published information on what happened in 2008 after the conflict with “Švinius” and the then deputy mayor of Tauragė. After that there was a change in government and the deputy mayor post went to Pranas Petrošius. Similarly I highlighted the well-known fact that when D. Petrošius, as a member of Seimas, attempted to push through a legislative project prepared not by them, but by a former lawyer associated with “Švinius’” entourage. Thirdly we have the deal publicised by the media, where there were signs of illegitimate dealings and fraud. I only shared those doubts. If we are operating under Western political standards, there politicians, aiming for significant posts, do not operate based on just reports and court cases. There are certain ethics and moral questions and I am glad that D. Petrošius demonstrated standards from Western culture. - So it appears that the stories were not conjured out of thin air? A. Sysas: Let us wait a bit. In Lithuania you can swat both flies and politicians with a newspaper. Many a politician has been swatted by various reports. If we are speaking of transparency, then everything needs to be transparently identified. However if someone had a top secret report which allows work with even criminal reports and now speaks of the person in question being related to “Švinius“ or other criminal elements, it‘s somewhat odd. - There’s a certain logic to it. Let me remind that D. Petrošius led the parliamentary Covert Action Control Commission. He was privy to top secret information. So is this a failure on part of law enforcement agencies or is the information you are sharing perhaps simply made up? P. Urbšys: I made up nothing, only specified known facts, which were publically available. I did not base it on any rumours. On the other hand I did not have those reports, I did not need them. Another question is why the services remained silent. He led a key commission related to controlling criminal intelligence. So perhaps the services found such a leader convenient? Some time ago I was present at the commission and I would not describe it as parliamentary control. More so excursions to institutions and imitating control. - What happened with J. Sabatauskas is even more interesting. Why did you back off after proposing him? A. Sysas: The name was only mentioned. D. Petrošius did not pass, meaning that J. Sabatauskas remains. There was no confirmation that it will be him. This was a real test for the “Peasants”. They failed it. To them criteria are below the belt, not to speak of human rights and all other things. - The arguments of the new Prime Minister that a younger individual is needed sound like a breach of human rights. Is this a sufficient argument? P. Urbšys: Let us agree that this cabinet is not being formed traditionally. The PM wants to form a driven, youthful team. Asking that coalition partners would select candidates who fit the criteria is not bad. We can remember the previous term, S. Skvernelis was Minister of the Interior. At one time the story of implementing the Administrative Code was escalated. Supposedly the Minister of the Interior did not do all he could to implement it. Such a situation arose because the Law and Law Enforcement Committee set a date with no clear motives and the date was already clearly impossible to prepare it for. - In other terms, the current PM elect has unpleasant experience working with J. Sabatauskas? P. Urbšys: I can only make a personal observation here. - Mister Sysas, the “Peasants” have varied views on candidates. It is, however, well known that Sabatauskas appears to be a new generation politician, having been born in Siberia and raised in an exiled family. He was not a communist, worked at a factory, later obtained a further education. He has been a Social Demcorat since 1989 with a blemish free record, a principled politician. Why are you selling your own so easily? A. Sysas: We sold no-one off. Let them continue reviewing. We will not bring up further names. I do not believe that the composition of the coalition in Seimas or the cabinet is some sort of UAB [private company] or collective farm, where you can dictate what sort of employees you want. If we are a coalition we have to respect certain decisions made by our partners. The SocDems did not demand specifying candidates. We found it out from the media. It is mystical how a driven team is being formed, time will show how things go. - Mister Sysas, it is fairly difficult to discuss with the “Peasants” because they can raise any demands they wish, but you are the delegating party. What does a “young” politician mean? Physically young or a person who is unrelated to party nomenclature or such? A. Sysas: First comes competence. Ministries require knowledge and experience. Reputation, morals and all other things that our coalition partners like to speak about, our candidate fits all these criteria. But then they declare that he is too old. - Mister Urbšys, what is a greater factor – physical age or personal, formal traits, reputation, past and such? P. Urbšys: No doubt reputation and formal traits matter a great deal. But I would like to repeat, the PM has his own view of his team. He accepts responsibility. This time the cabinet is being formed based on different principles. Firstly looking at professionalism and transparency. Do you view the “Peasants” as pushing their own through into ministries? Nothing of the sort. The PM, having a vision for a specific cabinet is sharing this vision with his coalition partners. The partners, having being presented the vision should make changes the people expect, should agree that the cabinet is being formed somewhat differently. Perhaps another, better result will happen. - Mister Sysas, do you not get the impression that the SocDems are facing one misfortune after another? Even speaking of points and proportions at an elementary level, it appears that the party could have obtained 4 ministries, not 3, perhaps you would have obtained even the post of Seimas Speaker, without trading the Ministry of Social Security and Labour to the Ministry of Economy and such. A. Sysas: No, I do not get such an impression. We are more experienced, we back down to our partners for Lithuania. When we need to pass laws, make serious decisions, then we’ll see. We do not want futile clashes due to individuals. We can grit our teeth and cooperate, but there are certain limits. We’ll survive it somehow. We survived a number of governments. We care more about doing work. Even what the “Peasants” have planned will not go well without the aid of the Social Democrats or other experienced parties. - Or perhaps J. Sabatauskas is strong, too strong to be a member of the cabinet? Perhaps given the experience of the others, it would be too tough a nut for the cabinet, Mister Urbšys? P. Urbšys: It is hard for me to judge. But I would like to respond to what Mr. Sysas is saying, regarding the grit teeth and such. I believe that normal processes in forming a cabinet are happening. That coalition partners have differing views is normal. That the formation process is unusual is also normal to me. That the SocDems chose the Ministry of Economy in lieu of resolving social problems, I believe isn’t a completely accurate statement because specifically now it is accented that in the government the centre of power should shift to the Seimas as outlined in the Constitution. Meanwhile none other than A. Sysas is the head of the Social Security Committee. Hence the Social Democrats are not removed from resolving social issues. They will specifically be in the committee and will form strategy. For now it is all just emotions.